Original Oil Paintings by Artist Suzanne Poursine Massion - "First Light In The Wolf Moon"
"Native Americans call the month of February the Hunger Moon. Outside my studio windows, the February sun is hidden behind an overcast sky. 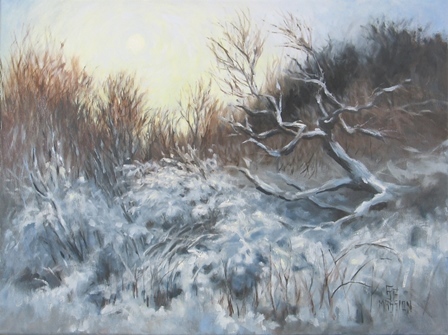 In struggling to break through the clouds, this strange wintry sun compels me to catch the effect on canvas. A broken tree lying in snowcoverd brush completes the Hunger Moon landscape." 3/4" gallery wrapped finished sides.